Walk This Way: Crossing The Golden Gate Bridge On May 27, 1937, San Francisco's Golden Gate Bridge opened, connecting bustling San Francisco to sleepy Marin County to the north. The Oakland-Bay Bridge had opened six months earlier — but the Golden Gate was an engineering triumph. And on its first day, thousands of people walked across it. 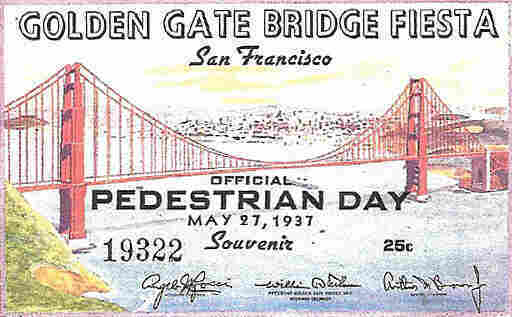 On May 27, 1937, San Francisco's Golden Gate Bridge opened, connecting bustling San Francisco to sleepy Marin County to the north. The Oakland-Bay Bridge had opened six months earlier — but the Golden Gate was an engineering triumph. It straddles the Golden Gate Strait, the passage from the Pacific Ocean into the San Francisco Bay, where rough currents prevail and winds can reach 70 mph. 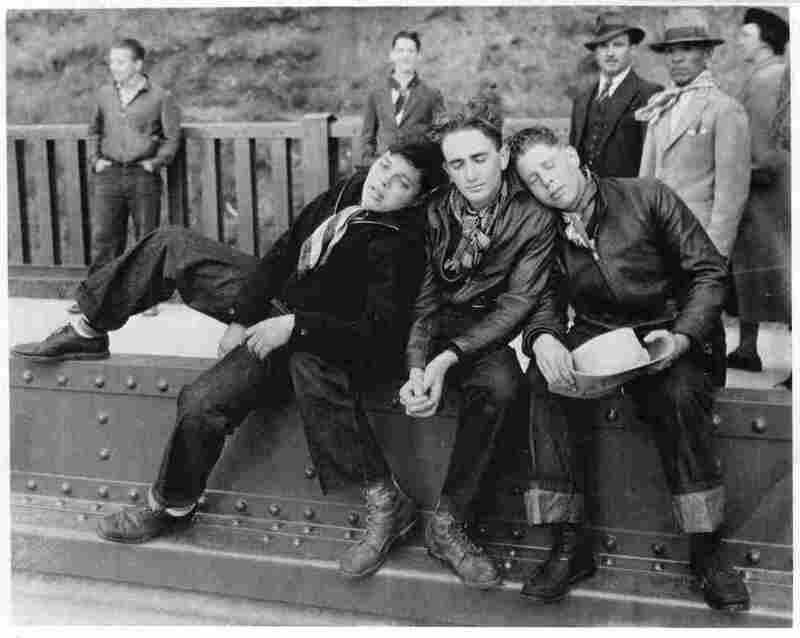 The night before the bridge opened, 16-year-old Edgar Stone and two high school friends finished watching a movie in a San Francisco theater. They decided to head to the bridge and be the first in line to cross. They hung out all night, unable to sleep. Come morning, they trotted across the almost 2-mile span. When they got to the other side, the three teens collapsed on a railing to rest. NPR Special Correspondent Susan Stamberg explains how the Golden Gate Bridge got its orange-ish hue. "We thought if we got lucky, we might get our picture in the paper," says Stone, who's now 91. And they did get lucky: A photographer from the News-Call Bulletin snapped the three teens leaning into each other, eyes closed. "We were truly tired, although we were putting on a bit of show," Stone says. Besides the exhaustion, Stone remembers being above the San Francisco Bay for the first time and how far down the water appeared. "Kind of a little frightening to look over," he recalls. Nancy Kent Danielson, 85, had the same feeling as she saw the vast ocean on one side of the railing and the bay on the other. She was only 11 when she crossed the bridge on opening day with her parents and twin sister, Martye. "But I was looking at people's waists," she says. "I did notice that the roadway rose under our feet, that we were going uphill, and that took us all the way to the middle of the bridge before it leveled off, and then we could go down a bit." When it opened, the Golden Gate was the longest suspension bridge in the world. And it helped the city grow — but not everyone liked the idea. "My father had a friend who thought the worst crime in the world would be to put a bridge there and spoil the beauty of nature," Danielson says. The Marin Garden Club, where Danielson's mother was a member, even wrote letters in protest of the bridge's unusual color. "They didn't think it should be anything but silver," she says. "We suspected the bridge was going up just so it could ruin Marin County," she says. Marin residents were bracing for saloons and quick-food stands. And that's just what happened, Danielson says. With a laugh, she adds, "I love people, but there are too many of us!" Lola Silvestri, 90, remembers reading about the building of the bridge practically every day in the newspaper. "They only hired single men because of the danger," says Silvestri, who was 16 on opening day. "We started out on the bridge as strangers," she says. "By the time we got to the other side, we knew everybody." At the bridge's last tower, Silvestri met a bridge worker who showed the teenager and her friend where he cemented in a dime. "I was thinking about that the other day," she says. "It was the end of the Great Depression, and there was the song 'Brother Can You Spare a Dime' — and I was wondering, what could you buy for a dime today?" George Klein, 95, was 20 when the bridge opened. It was cold, and he was wearing shorts. A former high school track star, he hoped to be the first to cross from the north end of the bridge in Marin. "I ran all the way to the other side, but I couldn't find any officials," says Klein. So, he just turned around and jogged back. What Klein or anyone could foresee was that the Golden Gate Bridge was destined to become a global tourist attraction. Back then, it was a symbol of progress even during hard times. And before the bridges, the only way to get around the bay was by ferry. But the ferry had its advantages, Klein says. "I could take a train, then a ferry, and then take another ferry and then a train and make it to downtown Oakland in an hour and five minutes," he says. "And I defy you to do that today with the bridges — that's how things have changed." The ferries still run today — they're popular with tourists and some commuters. Their decks provide an open view of the landscape and the Golden Gate Bridge, now 75 years old. And dwarfing all — the sea. The audio of this story incorrectly says the Golden Gate Bridge is red.